My mother gave me a booklet in 1985, when it was published: Kitsi Finnish Foodways, a publication of Suomi College (now called Finlandia University) for FinnFest 1985. My copy of Kitsi is yellowed. My dear, departed mother, who worked at Suomi College’s Finnish-American Heritage Center for more than twenty years, drew the illustrations on Kitsi’s cover. Leipäjuusto is an unusual creation that I really like with rye bread, when in Finland. 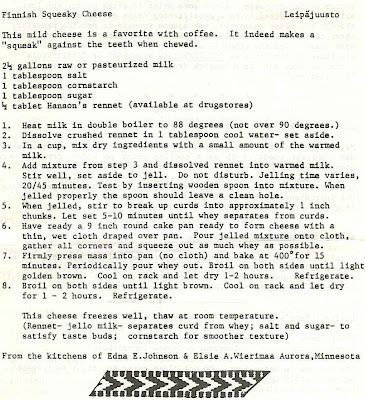 Here is the recipe for making your own Finnish Squeaky Cheese.Update: I’ve just found my mother’s friend, Beatrice Ojakangas’ blog, where she hosts a richer recipe for leipäjuusto. Preheat the oven to 350 degrees F. Butter a 9 by 13-inch cake pan. In a large bowl, cream the butter and sugar together; add the eggs and beat until light. Stir the flour, baking powder and salt together and add to the cream mixture alternately with the cream. Mix until batter is smooth and spread into the prepared pan. Insert the apple slices so that the outer edges of the apple slices are up. Sprinkle evenly with the cinnamon sugar and bake for 45 to 50 minutes or until a toothpick inserted into the cake comes out clean and dry. Serve warm.